A former newspaper editor who led four weekly titles during his career has died at the age of 80. Geoff Cottrell, left, edited four titles in Worcester, the AdNews, Berrow’s Worcester Journal, the Malvern Gazette and Ledbury Reporter, before retiring in 1998. He started out in journalism following National Service at DC Thomson where he worked for The Sunday Post and met his wife Joyce there. Geoff moved to County Cork in Ireland following his retirement and died there on Friday. 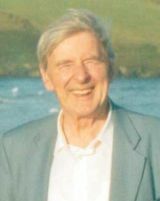 David Griffin, his former group managing editor in Worcestershire, said: “He was a definitely a journalist of the old school. He always put journalism and his editorial decisions before all other matters. “He wasn’t easily influenced by outside pressures and was completely committed to the newspapers he was editing and worked unstintingly on behalf of his readers, to present a comprehensive news service. “He was well-liked and he was wonderfully supportive of his staff, especially his younger staff. Geoff went into journalism following National Service in Royal Air Force Intelligence, after his commanding officer recommended it as a profession for him. After working for DC Thomson, he went on to work as a sub-editor for the Worcester News, before becoming editor of the now-defunct AdNews series. He went on to hold further editorships for its sister titles, which are now owned by Newsquest, and when he retired he was at the helm of the Malvern Gazette and the Ledbury Reporter. While in Worcester, Geoff became a member of the Guild of British Newspaper Editors and was secretary of the West Midlands region. He moved to County Cork in Ireland in 2000 to pursue his hobby of fishing but heart trouble later made that impossible. Geoff is survived by his wife Joyce and son Roger. I can only endorse what David Griffin has said about a great guy to work with and a true gentleman who truly cared about all the newspapers he worked on.